The Lahemaa national park is a coastal national park in Estonia, located along its northern, Baltic sea coast 60km east of Tallinn. The park has a total area of 725km² of which 475 km² are forests, lakes, rivers and peat bogs and 250 km² are sea area. The terrain is mostly flat, with the highest point at 115m asl. In the park there are a number of manors, including the 18th century Palmse manor which nowadays hosts a museum and the 18th century baroque Sagadi manor which has been converted to a hotel. All over the park there are a number of trails for visitors. 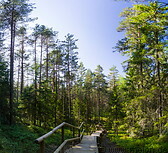 The park hosts 840 plant species and 50 mammal species including brown bear, lynx and wolves.